2016 release, the 10th studio album from Swedish metal kings Amon Amarth. 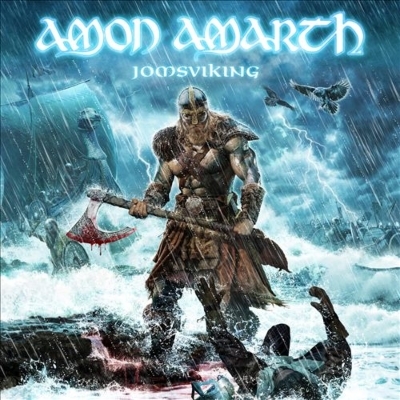 Jomsviking - the band s first concept record in their storied career - tells a tragic tale of love and revenge, backed by the Swedes trademark melodic, anthem metal, which was produced and mixed once again by Andy Sneap (Megadeth, Testament, Accept) and also features special guest session drummer Tobias Gustafsson (Vomitory). The epic original story is set in the world of the Jomsvikings, the legendary order of mercenary Vikings. As front-man Johan Hegg explains: The Jomsvikings were a shadowy and legendary sect of Viking mercenaries, as shrouded in myth now as they were when they fought across Europe and the Middle East. Ruthless and deadly warriors who fought for the highest bidder, their code was simple: Show no fear. Never retreat. Defend your brothers, and when called upon, avenge their deaths. I felt we were finally ready to use their story as the jumping off point for an Amon Amarth album. The Jomsvikings and their world is the background for the story of a young man that is in love with a girl but unfortunately she's being married off. He accidentally kills a man when this happens and he has to flee but he swears to have revenge and win her back. He feels that he s been wronged and his life has been destroyed. The way the story evolves is not a happy story.